Fun & Inspiration Don’t Get Married Until You’ve Asked Your Partner These 15 Questions! 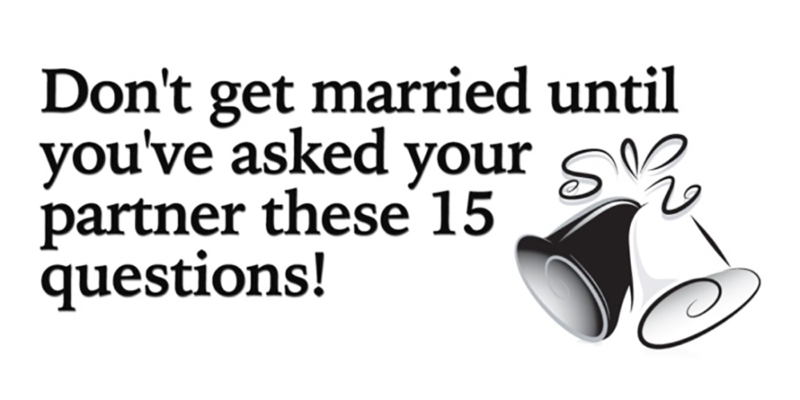 Don’t Get Married Until You’ve Asked Your Partner These 15 Questions! Marriage is one of the biggest commitments you can make to a person, other than starting a family together, which usually comes after the wedding. Be absolutely sure without a doubt that you’re ready to tie the knot with your honey by asking these 15 important questions. 1. Who will be the primary caregiver if we have kids? Maybe we will split it evenly, or one of us will work outside the home and the other will stay with the kids. 2. Do we understand and agree on each other’s financial system? Do we see eye to eye on how spending and saving should happen, and what about large purchases? 3. What are we expecting as far as cleanliness goes for our marital home? Are we going to evenly split the house work, or devise a unique system so that our biggest pet peeves get taken care of regardless of how busy we are or what else may be going on. 4. Are we both fully aware of each other’s healthy history? This means mental, emotional and physical health. Especially important if you’re planning on having kids and you’re worried about genetic issues. 5. Are both of our needs being met when it comes to affection? Everyone needs reassurance from their partner sometimes, and many people find that in the physical affection they receive from their spouse on a daily basis. 6. Can we comfortably and freely discuss our sexual needs and desires? It is paramount that you can be open with your partner about what is good and what needs to change in the bedroom. 7. Will we have multiple televisions, and will one of them be in the bedroom? This is one most people don’t really think about before getting married, but it can be a big point of contention. 8. Do we really, deeply trust each other and do we truly listen to each other’s needs? 9. What are the differences and similarities in our spiritual or religious belief systems? Do we respect and understand the differences, do we have any problems supporting beliefs that may oppose our own? 10. Do we have mutual friends whose company we can enjoy together? This one matters more than you might think. It’s important not to live separate lives outside of the house or bedroom all the time. You need a social circle that you can both have fun spending time with. 11. Do we have respect for each other’s families and relatives? Do we value the input and opinion of loved ones who are important to our significant other? Can we be civil and friendly during family functions? 12. Does my family do or say things that upset you? It’s important to have full disclosure on this subject from both partners. You need to be prepared to diffuse any difficult situations that may arise over time. They always do. 13. Is there anything you would simply never change for marriage? 14. If one of us received an amazing opportunity that depended on us moving far away from friends and family, are you open to that?